Resources and information aim to assist those with disabilities to lead a full life. So people with disabilities participate in the same kinds of activities everyone else enjoys—including study and volunteer abroad —Mobility International USA developed a website that not only motivates people with disabilities (and their families) to take advantage of life’s opportunities, but also provides easily-accessible resources to help them get started. 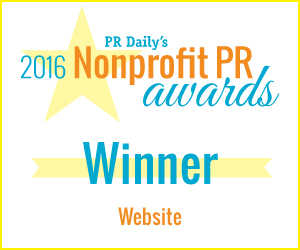 Its success has earned it first place for “Best Website” in Ragan’s 2016 Nonprofit PR Awards. The site at www.miusa.org shows people with disabilities how to get involved in overseas service programs or find low-cost international travel programs. The site also provides information about everything from tapping into Social Security benefits while traveling abroad to charging a power wheelchair to bringing a service dog along on a trip. Similar resources assist people with disabilities wanting to travel to the U.S. The site also provides resources to assist individuals and organizations obtain the skills needed to advocate for disability rights. A collection of materials promotes the results the organization has achieved. The organization has also launched a companion site dedicated entirely to disability rights: www.globaldisabilityrightsnow.org. The work on the MIUSA site has paid off, with more than 116,000 visits in 2015. Eighty-two percent of the visitors were new to the site, and the number of mobile visitors tripled from 2010. Individual feedback has also been overwhelmingly positive The sites are responsively designed and made accessible for a cross-disability audience. Congrats to Michele Scheib and Jamie Rivas for coordinating informative and inspiring websites for people with disabilities. MIUSA would also like to thank the contributing partners, sponsors, and consultants: the U.S. Department of State, the U.S. International Council on Disabilities (USICD), the Disability Rights Education and Defense Fund (DREDF), the International Foundation for Electoral Systems (IFES), Experience Dynamics, Palante Technology Cooperative, and ThinkShout, Inc.